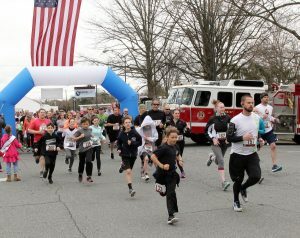 Come out and celebrate our 4th running of the Easton Volunteer Fire Department’s Stop, Drop and Run 5k run and 1 mile walk, on Saturday, April 13th, 2019. The fun starts at NOON at the Easton Volunteer Fire Department. Registration and packet pickup starts at 10am!! Your entry fees cover your race (5k walk/run or 1 mile walk), a BBQ lunch and 2 beers (for those participants above 21 – ID REQUIRED). All of the proceeds go back to the Easton Volunteer Fire Department!! PLEASE BRING YOUR ID to be able to retrieve your 2 complimentary drinks aftewards. Please consider bringing cash for our CASH ONLY 50/50 raffle, to be held immediately after the race. If you are interested in becoming a sponsor, please email us at EastonVFD5K@eastonvfd.org for more info.